As more and more consumers today come with smartphone attached, the opportunities for marketers to start a mobile dialogue with their consumers anywhere and anytime are ever expanding. While some are starting to successfully include an offline call-to-action as part of their mobile marketing strategy, many marketers still miss the opportunity. We offer our top tips for connecting with your on-the-go consumers through mobile, amplifying their engagement across all channels and boosting the effectiveness of your integrated marketing assets. Mobile is the connection media channel. In digital marketing training we’ve been showing how mobile can bridge the physical and digital worlds. From Singapore to Sao Paulo, Mumbai to Milan, we’re seeing more brands wake up to the powerful role that mobile can play to join up channels. Get this element of your mobile marketing strategy right and you’ll see consumers connecting back to your brand in their millions – but it’s easy to miss a trick. Marketers have a big range of mobile tools and tactics to select from. The trick is to understand what’s already a mainstream, familiar behaviour among your target consumers. In developing and emerging markets that means using simple SMS or smart voice techniques like “Interactive Voice Response” that every consumer is comfortable with, while for tech savvy younger consumers in developed markets GPS-linked location tools and augmented reality might be worth experimenting with. If you’re not sure which technologies your consumers use or how they use them, then look to some of the powerful market research data sources like TNS Mobile Life – or simply ask your media agency. Simple SMS messaging lets consumers reply to your advertising and promotional messages, texting back to a shortcode you’ve included. It’s the most widespread form of mobile marketing, it’s easy to manage and many brands have millions of consumers on regular SMS relationship marketing programmes. In technically advanced markets it’s been a key tool in sampling programmes for 10 years, and a great way to build a database of your brand adorers. 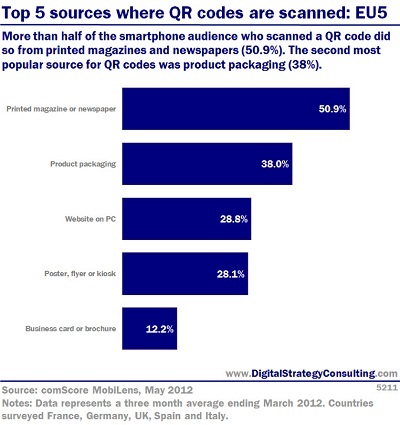 In several countries the QR codes have started to gain traction. They let an Internet-connected phone translate the photograph of a QR code into a URL link that takes your consumers to new content, going on a deeper journey with your brand. These are particularly effective with younger consumers, and if the content they receive after using the code is strong enough, then your idea may ‘earn’ a lot of free media as one fan tells the next. It may still feel like something out of science fiction, but among tech-savvy consumers, it’s a great way to get deep engagement. Using a smartphone or tablet, the photograph of a product or image unlocks a virtual layer of content that augments reality. Thousands of brands have tried these techniques in their mobile marketing strategy, and the approach works particularly well when the content is rich and entertaining. To comfort children in their hour of need, Band-Aid teamed up with Disney to embed videos of The Muppets in their plasters using augmented reality. The Johnson & Johnson brand created an entertainment experience, turning a traumatic moment for children into fun for them (and relief for their parents!). We’re moving into a world where our experiences via mobile interactions can now be customised based on where we are. Using either simple mobile location based data, or advanced GPS tracking, once you know where a consumer is, the content they see on your web pages or apps can be tailored. This could be as simple as a search engine showing you ‘your nearest’ taxi company, restaurants sending your locally relevant offers, or creating a complete consumer journey based on the experience. The last few years have seen many food scares, and the food industry is now heavily focussed on the quality of its sourcing and the traceability of its ingredients. 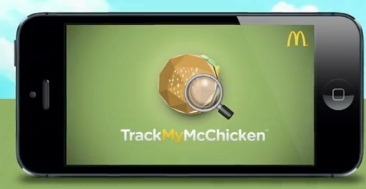 McDonalds realised the opportunity and built an app that let consumers in Australia see the history of the products they were eating. Clever integration with packaging took consumers on a journey that boosted understanding of the brand, removed false perceptions about sourcing and increased trust at a time when consumers were losing trust in the food industry in general. While many marketers are starting to add a mobile-activated call-to-action within their traditional advertising, on the street, at point of sale, on packaging and product few are getting the most out of this potential. All too often calls-to-action are unclear, difficult to read and badly positioned. Little thought is given to the viewing experience. Marketers ask for audience participation through minimised Facebook / Twitter / YouTube logos and illegible or unmemorable website addresses. Worse still they incorporate QR codes into places that simply don’t work. Examples like that from the South Africa Tourism Board are all too common. 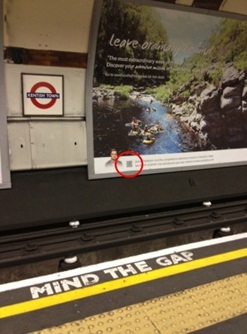 They made the mistake of putting a tiny QR code on their massive cross-track poster on London’s underground railway network – in stations without mobile signals or Internet access. There’s a growing catalogue of QR code fail examples. See http://wtfqrcodes.com/ . To get the biggest interaction, make the process clear and simple for your time-pressed, on-the-go consumer. Think about where the person is when you want them to act. Adapt your call-to-action to make the most of the location. Think about how you might tailor the message if it’s on packaging, at a bus-stop, on an Underground train station, in a taxi, at a music festival or in a store. Make the website address big enough to be seen. Spell out the Facebook brand page address in full. Use QR codes only in place where they will work. Too often little encouragement is given to the audience to connect via their mobiles. Little incentive lies behind the call-to-action to make it worthwhile or compelling. While the advertising and promotional content might do the job of attracting and enticing the consumer, additional persuasion will help them to take the next step. Marketers should offer a direct value exchange to mobile responders. It could be a tangible reward of a money-off coupon, chance to win, or some specific downloadable content (ie exclusive video clip, recipe content, a guide). Or it could simply be a taste of what to expect. Alongside the call-to-action highlight what’s on offer, describe the available digital content, sell the benefits. 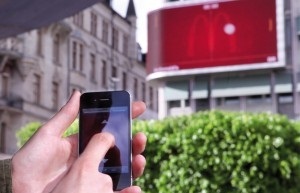 McDonald’s incentivised the pass-by audience to play its mobile-activated interactive billboard pong game with the chance to win a mobile coupon for free food at their nearby outlet. The deodorant brand Axe made great use of QR codes in their ‘Peephole’ campaign, where the potential pay-off for interacting – ever more risqué content - was made perfectly clear to their young male audience. With increasingly sophisticated smartphones in their hands consumers are not only able to download content and communications from brands but can also upload their own user-generated content. As such, bridging the physical and digital via mobile gives marketers today a great opportunity to generate earned media from their audience - wherever they may be. Whenever possible, invite mobile consumers to interact with your social media platforms, for example to upload a like, a message, a photo or even a video clip. Incentivise this audience response with some real reward. Look for occasions when consumers might have more time on their hands – eg when reading a magazine, waiting for a bus, shopping in a store, enjoying a live event. These make for good moments to encourage content uploads. 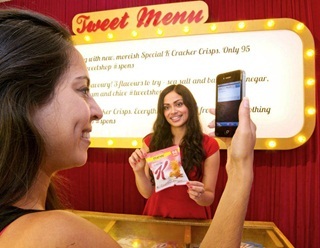 To receive a free sample of their new Cracker Crisps product Kellogg’s Special K encouraged visitors to their pop-up Tweetshop to post positive messages on Twitter via mobile using a unique hashtag. Similarly, the shirt brand Allen Solly incentivised passers-by to send tweets via their mobile for the chance to win free shirts from the store. Marketers should recognise the growing number of modern, smartphone-enabled consumers who live today in a world of continuous social sharing. In 2012 Comscore reported that nearly a third (30.6%) of European mobile users were accessing a social network site or blog via their handset regularly. Tapping into this growing consumer behaviour is likely to help create greater participation in mobile calls-to-action. Encouraging audiences to perform a brand-related check-in, like, post or tweet will appeal to those looking to update their personal social network. And it’s a great way for the brand to spread positive word-of-mouth from the real to the online world. 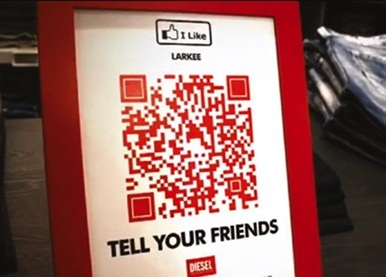 Understanding that most of their fashion-conscious consumers would be in possession of the latest mobile technology, Diesel offered shoppers in their clothing store the chance to ‘like’ products on Facebook by scanning a QR code. Through this mobile marketing strategy a little local retail therapy was amplified to a much wider network of like-minded people online. The more communal and contagious the call-to-action, the more likely you are to compel connected consumers to respond. For brand fans, the opportunity to ‘join the conversation’ or ‘start a movement’ can seem like be a call to arms. 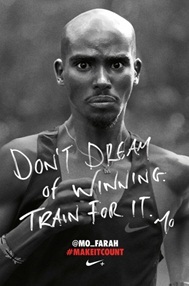 Nike exploited this in their ‘Make It Count’ campaign. They encouraged their sports-mad fans to join the conversation on Twitter using highly impactful, billboard advertising. However mobile response mechanics are included in brand communications, marketers must recognise that those consumers willing and able to participate are highly valuable. Treat the response as the beginning of a longer-term relationship not a one-off interaction. Enter respondents’ details into an actively managed mobile database. Then establish an on-going, mobile CRM dialogue (eg via email, text or social platforms) that nurtures and develops them into brand loyalists and advocates over time. Take mobile marketing strategy further?